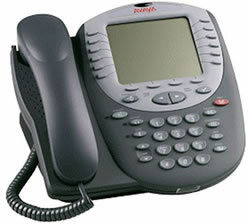 This single line telephone is ideal for telecommuters and everyday office use. Features a large graphical display (grayscale, 168 x 132 pixels), 24 programmable call appearance / feature keys and 11 fixed feature keys. Also includes a message waiting indicator, a built-in headset jack and a full-duplex speaker phone for audio conferencing. 11 Fixed Feature Keys: Speaker, Mute, Hold, Headset and Volume Up/Down, Conference, Transfer, Hold, Redial and Drop. Large graphical gray-scale display (168 x 132 pixels). The 4620SW includes all the above features plus an integrated Ethernet switch for PC connection.